Hockey’s getting back into the swing of things a little earlier this year with the return of the World Cup of Hockey, kicking off at Toronto’s Air Canada Centre on September 17th. Our crew already broke down each team’s uniforms when they were revealed back in March, but the masks are rolling out fast for the highly anticipated tournament, so let’s take a look at the Scandinavian teams. 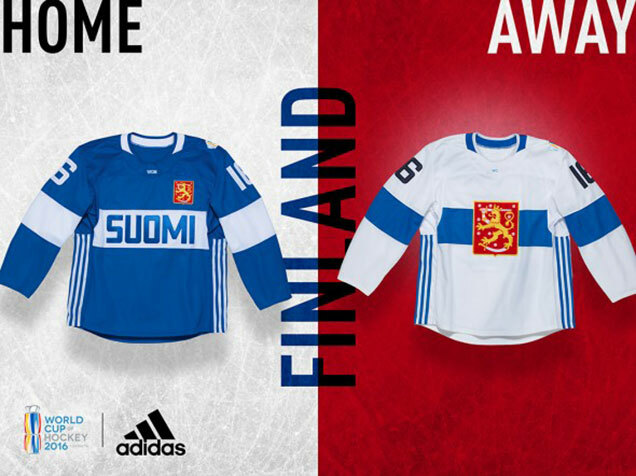 For Finnish KHL goaltender Mikko Koskinen, Dave Gunnarsson drew inspiration from Finland’s flag and crest as well as the nation’s rich hockey history. 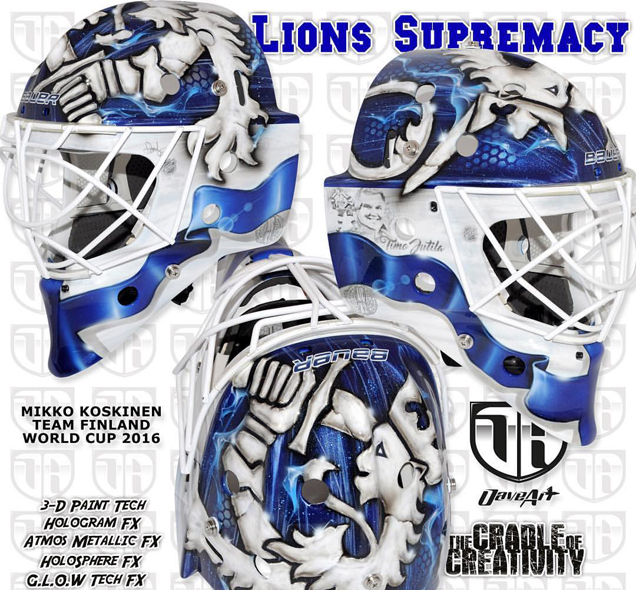 Titled “Lions Supremacy,” The mask features a Finnish flag in the front formed by blue ribbons cascading down the sides. The white background is filled in with sketch pen detailing of NHL and World Cup logos and a tribute to retired Finnish defenseman Timo Jutila. The hologram blue paint on the top serves as a backdrop for a white lion based off the Finnish coat of arms. 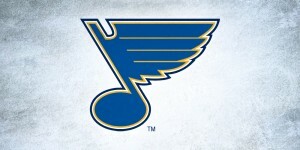 Koskinen has heavyweights in Tuukka Rask and Pekka Rinne to compete with for ice time in this tournament, so ice time may be hard to come by, but in the event that he does get his chance in the net, this bold, blue mask will look great with the colors in Finland’s unis for the tournament. 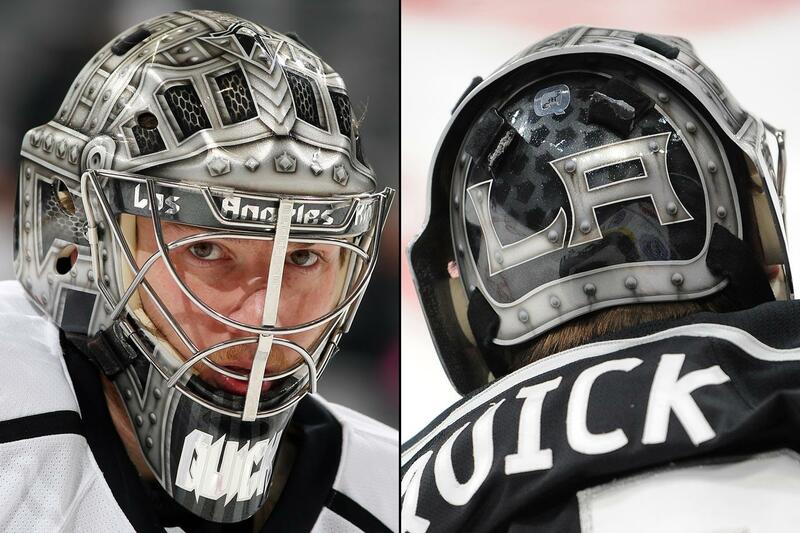 Goalies are known to be some of the most superstitious among athletes, and some stick with the same (or a very similar) mask design year after year. Tuukka Rask is one of those goalies, rarely straying from his signature Bruins look even for events like the Olympics or in this case, the World Cup. Painted by Rask’s regular artist, Boston-based Ron Slater (you can read our interview with him here), the Bruins goaltender kept many elements from his Boston masks but with a Finnish twist. 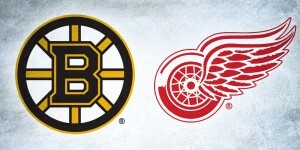 The style of lettering for Rask’s name on the chin remains unchanged with the exception of the color. 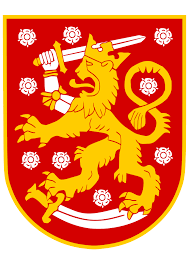 In place of the red-eyed bear on top of the mask, Slater instead placed a crowned lion as a nod to the Finnish coat of arms reaching over the sides and grasping the coat of arms itself. 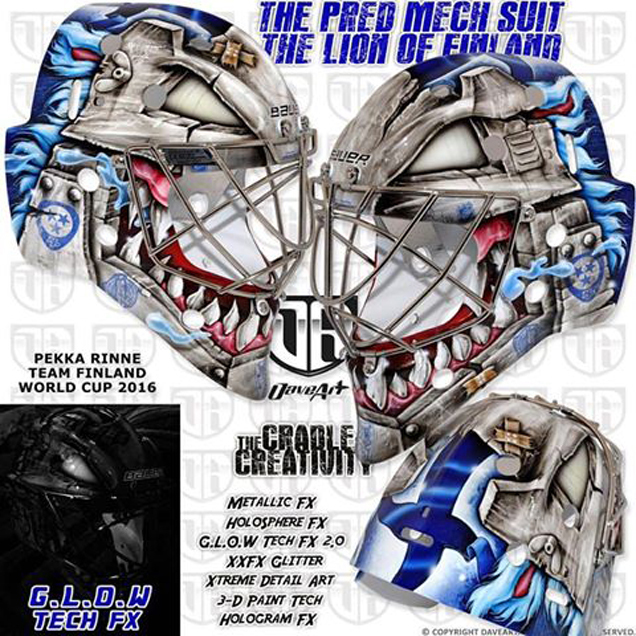 The backplate boasts the Finnish flag––also a mainstay on his Bruins masks––and Tuukka’s name in a Metallica-esque font, apropos given the goaltender’s passion for the band as well as Finnish metal. Like with all of Tuukka’s masks, the simplicity of the composition really allows Slater’s artistry and attention to detail to shine through. Yet another job well done for this long time pair. In possibly the least shocking World Cup mask reveal, King Henrik commissioned not one but two masks from Dave Gunnarsson that are all but identical to what he’s worn in New York and for the Olympics every season in recent history. 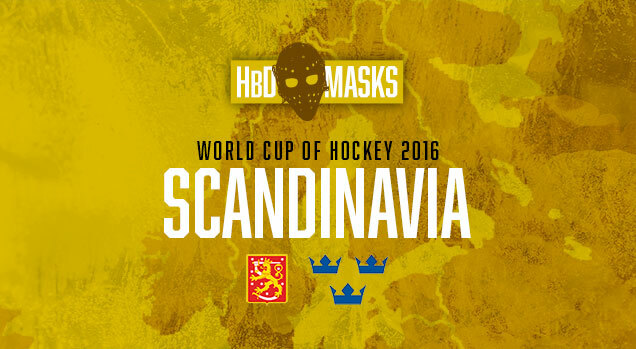 As revealed by the goaltender on Instagram, it’s “always good to have options,” and the two masks are essentially replicas of each other with one in gray and one in blue, presumably to coordinate with Sweden’s home and away jerseys. 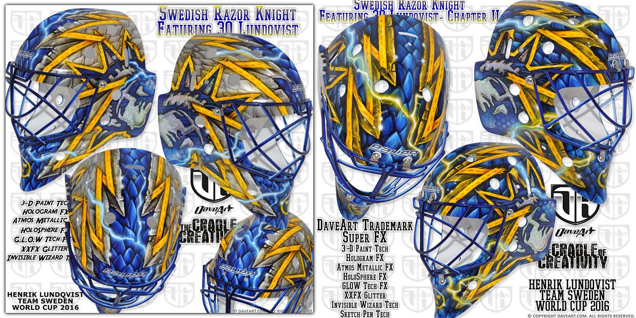 The razor patterns on both mimic the crown of Lady Liberty, a nod to the Rangers and the big apple, as well as the Swedish “Tre Kronor.” Aside from the blue and yellow color palette, these could very well be Rangers masks, and we expect Hank’s Rangers mask this season to be very similar. The Manchester United striker is all over this mask with photo-realistic portraits and action shots all throughout both sides. 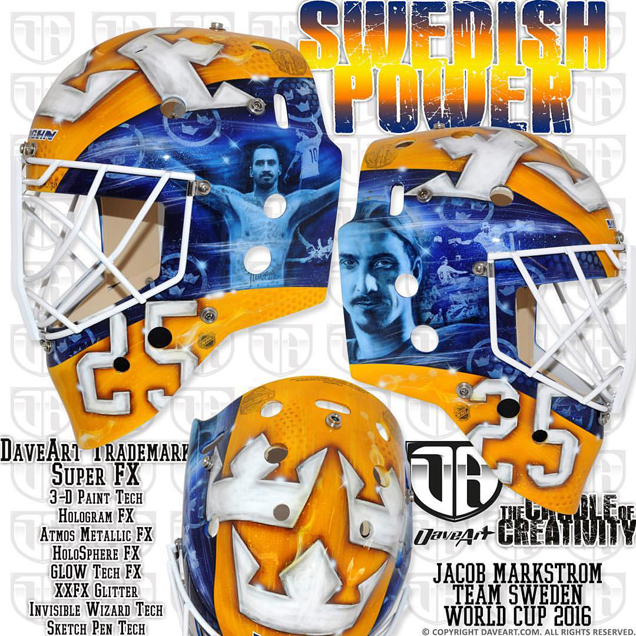 The rest of the mask stays relatively simple with subtle textural patterns in the yellow, but the primary focuses of the design are Ibrahimovic and the Swedish Tre Kronor. Like the crowns on top, Markström’s number 25 also stands out both for its coloring and its placement. 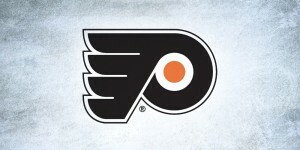 Being one of only two white elements on an otherwise saturated mask, the placement of the 25 off to the sides is also unique, rather than painting the number directly in the center of the chin as we so often see. Unlike on teammate Lundqvist’s mask(s), Markström shows no reference to his NHL club here and solely focuses on his home country. The soccer tie-in makes this mask unique and personal, one of the most interesting elements of an otherwise patriotic design. Rounding out the trio of Swedish masks is new Leafs goaltender Jhonas Enroth. 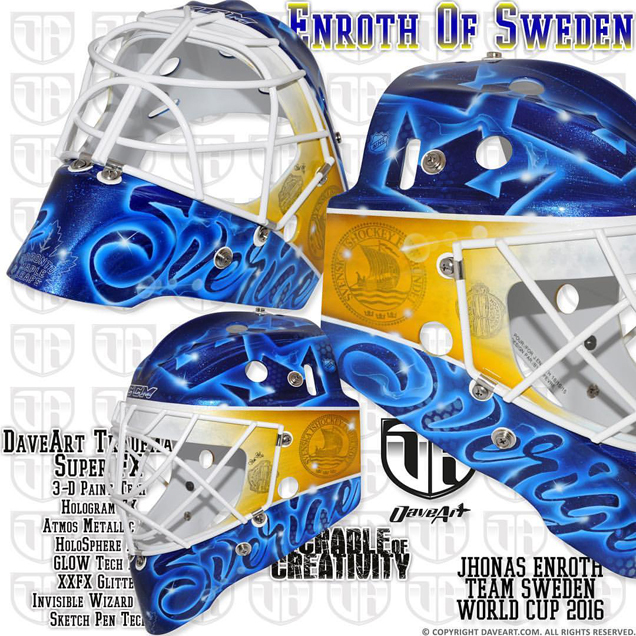 Compositionally similar to Markström’s, Gunnarsson divided this mask into thirds using the Swedish blue and gold gradient with “Sverige” (“Sweden” in Swedish) in script and Tre Kronor throughout the blue. 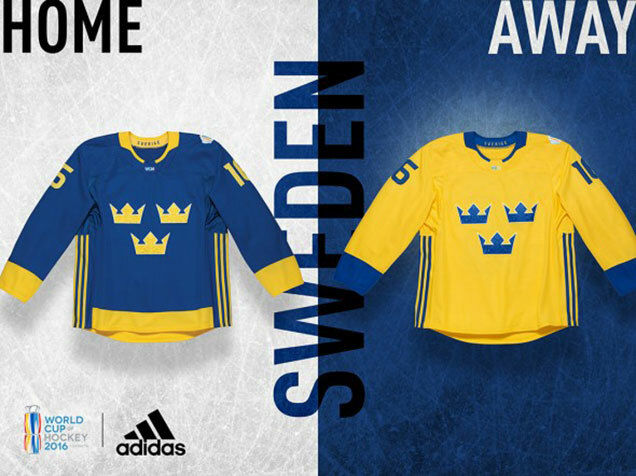 “It is a clean cut creation built on the three crowns and a lot of blue in a unique way,” Gunnarsson shared of the design. 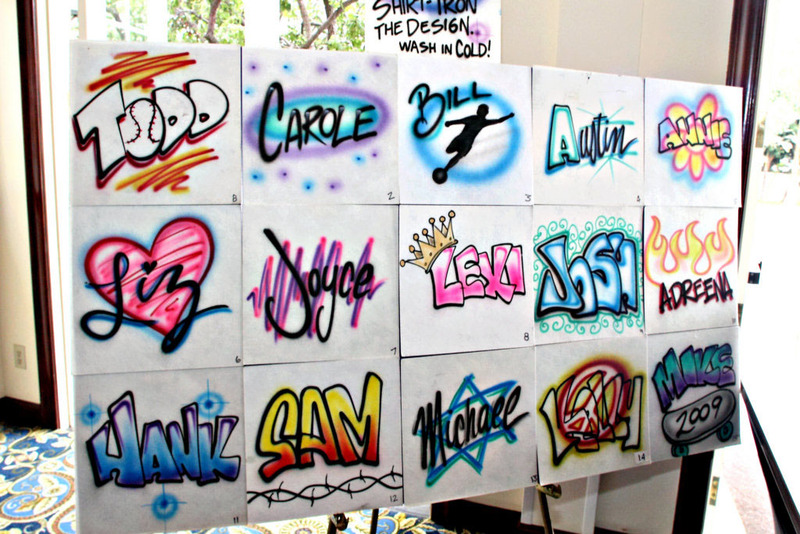 Also within the blue are stenciled Maple Leafs logos, light flares and other airbrushed effects. The outer glows and light flares are a disturbing reminder of my beach boardwalk days, but the color saturation if nothing else is really beautiful which helps offset the questionable taste of the details.